– want to increase your efficiency, self-management ability, and effectiveness in these difficult situations? – want to make progress with the people that most challenge you? then this workshop is for you! Difficult individuals can take our time, energy and sleep and can leave us anxious and distracted. In this engaging and empowering skill-building workshop, psychotherapist Catherine Comuzzi and mediator Gordon White have combined their decades of experience working with challenging individuals and issues. They facilitate an informative, engaging, and fun 2-day workshop that will teach you how to be more powerful, relaxed, influential, and generally effective when you are interacting with difficult people, or when you have responsibility for managing difficult people problems. In order to build your inner resources and ‘download’ new strategies and approaches into your toolbox, Gordon and Catherine will employ a variety of learning modalities including stories, audiovisual aids, interactive exercises, self-reflective time, step-by-step methods, readiness practices, demonstrations, and optional role-playing. This program is both outward looking at how to strategize and communicate more effectively, and inward looking towards recruiting stamina, resilience, and awareness. Catherine Comuzzi ED.D. Cg. Psych is a certified psychotherapist, educator and master coach. She has several graduate degrees and diplomas including a Doctor of Education in Counseling from the University of Toronto with Highest Distinction. Her career has centred around working with difficult clients in both the private and public sector. Catherine trains coaches for the Certified Coaches Federation, and she is an experienced and respected facilitator who has conducted numerous retreats and workshops for individuals and organizations in the United States, Europe, and throughout Canada. Gordon White, MBA is a mediator, trainer, and coach who delivers team development programs and coaches leaders in organizations; he mediates harassment allegations, grievances, and interpersonal conflicts; and facilitates large group processes. Gordon trains for the Justice Institute of BC and teaches a graduate course in Conflict Analysis and Management at Royal Roads University. He maintains a perennial interest in the challenging individuals he encounters, and a continued respect for the transformative potential of the conflict experience. To receive more information, please contact us using the form below, and we will get in touch with additional information. Thanks. Subjective well-being in Australia: When asked, 75% of people in Australia said they were satisfied with their life, much higher than the OECD average of 59%. Australia performs exceptionally well in measures of well-being, as shown by the fact that it ranks among the top countries in a large number of topics in the Better Life Index. Money, while it cannot buy happiness, is an important means to achieving higher living standards. In Australia, the average household earned 27 039 USD in 2008, more than the OECD average. In terms of employment, nearly 72% of people aged 15 to 64 in Australia have a paid job. People in Australia work 1690 hours a year, less than most people in the OECD. 71% of mothers are employed after their children begin school, suggesting that women are able to successfully balance family and career. Having a good education is an important requisite to finding a job. In Australia, 70% of adults aged 25 to 64 have earned the equivalent of a high-school diploma, only slightly lower than the OECD average. Australia is a top-performing country in terms of the quality of its educational system. The average student scored 515 out of 600 in reading ability according to the latest PISA student-assessment programme, higher than the OECD average. In terms of health, life expectancy at birth in Australia is 81.5 years, more than two years above the OECD average. The level of atmospheric PM10 – tiny air pollutant particles small enough to enter and cause damage to the lungs – is 14 micrograms per cubic meter, and is much lower than levels found in most OECD countries. Concerning the public sphere, there is a strong sense of community and high levels of civic participation in Australia. 95% of people believe that they know someone they could rely on in a time of need, higher than the OECD average of 91%. Voter turnout, a measure of public trust in government and of citizens’ participation in the political process, was 95% during recent elections; this figure is the highest in the OECD. In regards to crime, only 2% of people reported falling victim to assault over the previous 12 months. Subjective well-being in Israel: 72% of people in Israel said they were satisfied with their life, above the OECD average of 59%. In terms of employment, nearly 59% of people aged 15 to 64 in Israel have a paid job. 55% of mothers are employed after their children begin school, suggesting that women encounter difficulties when balancing family and career. In Israel, the average household earned 19 456 USD in 2008, less than the OECD average . Having a good education is an important requisite to finding a job. In Israel, 81% of adults aged 25 to 64 have earned the equivalent of a high-school diploma, higher than the OECD average. As to the quality of its educational system, the average student scored 474 out of 600 in reading ability according to the latest PISA student-assessment programme, lower than the OECD average. In terms of health, life expectancy at birth in Israel is 81.1 years, nearly two years above the OECD average. The level of atmospheric PM10 – tiny air pollutant particles small enough to enter and cause damage to the lungs – is 28 micrograms per cubic meter, and is higher than levels found in most OECD countries. Concerning the public sphere, there is a strong sense of community and moderate levels of civic participation in Israel. 93% of people believe that they know someone they could rely on in a time of need, close to the OECD average of 91%. Voter turnout, a measure of public trust in government and of citizens’ participation in the political process, was 65% during recent elections; this figure is lower than the OECD average of 72%. In regards to crime, 3% of people reported falling victim to assault over the previous 12 months. The United Kingdom performs very well in overall subjective well-being, as shown by the fact that it ranks among the top countries in several topics in the Better Life Index. Having a good education is an important requisite to finding a job. In the United Kingdom, 70% of adults aged 25 to 64 have earned the equivalent of a high-school diploma, close to the OECD average. As to the quality of its educational system, the average student scored 494 out of 600 in reading ability according to the latest PISA student-assessment programme, around the OECD average. Money, while it cannot buy happiness, is an important means to achieving higher living standards. In the United Kingdom, the average household earned 27 208 USD in 2008, more than the OECD average. In terms of employment, nearly 70% of people aged 15 to 64 in the United Kingdom have a paid job. People in the United Kingdom work 1646 hours a year, less than in other OECD countries. 67% of mothers are employed after their children begin school, suggesting that women are able to successfully balance family and career. In terms of health, life expectancy at birth in the United Kingdom is 79.7 years, slightly above the OECD average. The level of atmospheric PM10 – tiny air pollutant particles small enough to enter and cause damage to the lungs – is 13 micrograms per cubic meter, and is lower than levels found in most OECD countries. Concerning the public sphere, there is a strong sense of community and low levels of civic participation in the United Kingdom. 95% of people believe that they know someone they could rely on in a time of need, higher than the OECD average of 91%. Voter turnout, a measure of public trust in government and of citizens’ participation in the political process, was 61% during recent elections; this figure is lower than the OECD average of 72%. In regards to crime, only 2% of people reported falling victim to assault over the previous 12 months. When asked, 68% of people in the United Kingdom said they were satisfied with their life, above the OECD average of 59%. Korea performs moderately well in overall measures of well-being, as shown by the fact that it ranks higher than average in several topics in the Better Life Index. When asked, 36% of people in Korea said they were satisfied with their life, much lower than the OECD average of 59%. In terms of health, life expectancy at birth in Korea is 80 years, slightly above the OECD average. The level of atmospheric PM10 – tiny air pollutant particles small enough to enter and cause damage to the lungs – is 31 micrograms per cubic meter, and is much higher than levels found in most OECD countries. Concerning the public sphere, there is a moderate sense of community and civic participation in Korea. 80% of people believe that they know someone they could rely on in a time of need, one of the lowest rates in the OECD where the average is 91%. Voter turnout, a measure of public trust in government and of citizens’ participation in the political process, was 63% during recent elections; this figure is lower than the OECD average of 72%. In regards to crime, only 2% of people reported falling victim to assault over the previous 12 months. Money, while it cannot buy happiness, is an important means to achieving higher living standards. In Korea, the average household earned 16 254 USD in 2008, less than the OECD average . In terms of employment, nearly 63% of people aged 15 to 64 in Korea have a paid job. People in Korea work 2256 hours a year, much higher than the OECD average of 1739 hours and the highest rate in the OECD. 60% of mothers are employed after their children begin school, suggesting that women are able to successfully balance family and career. Having a good education is an important requisite to finding a job. In Korea, 79% of adults aged 25 to 64 have earned the equivalent of a high-school diploma, higher than the OECD average. Korea is an exceptionally well-performing country in terms of the quality of its educational system. The average student scored 539 out of 600 in reading ability according to the latest PISA student-assessment programme, the strongest performance in the OECD. Subjective well-being in United States: 70% of people in the United States said they were satisfied with their life, well above the OECD average of 59%. In terms of health, life expectancy at birth in the United States is 77.9 years, more than one year below the OECD average. The level of atmospheric PM10 – tiny air pollutant particles small enough to enter and cause damage to the lungs – is 19 micrograms per cubic meter, and is lower than levels found in most OECD countries. Concerning the public sphere, there is a strong sense of community and high levels of civic participation in the United States. 92% of people believe that they know someone they could rely on in a time of need, just above the OECD average of 91%. Voter turnout, a measure of public trust in government and of citizens’ participation in the political process, was 90% during recent elections; this figure is also higher than the OECD average of 72%. In regards to crime, only 2% of people reported falling victim to assault over the previous 12 months. Money, while it cannot buy happiness, is an important means to achieving higher living standards. In the United States, the average household earned 37 690 USD in 2008, much more than the OECD average. In terms of employment, nearly 67% of people aged 15 to 64 in the United States have a paid job. People in the United States work 1768 hours a year, more than in other OECD countries. 73% of mothers are employed after their children begin school, suggesting that women are able to successfully balance family and career. Having a good education is an important requisite to finding a job. In the United States, 89% of adults aged 25 to 64 have earned the equivalent of a high-school diploma, higher than the OECD average. As to the quality of its educational system, the average student scored 500 out of 600 in reading ability according to the latest PISA student-assessment programme, slightly higher than the OECD average. Canada performs exceptionally well in measures of Subjective well-being. When asked, 78% of people in Canada said they were satisfied with their life, much higher than the OECD average of 59%. Life expectancy at birth in Canada is 80.7 years, more than one year above the OECD average. The level of atmospheric PM10 – tiny air pollutant particles small enough to enter and cause damage to the lungs – is 15 micrograms per cubic meter, and is lower than levels found in most OECD countries. Concerning the public sphere, there is a strong sense of community but only moderate levels of civic participation in Canada. 95% of people believe that they know someone they could rely on in a time of need, higher than the OECD average of 91%. Voter turnout, a measure of public trust in government and of citizens’ participation in the political process, was 60% during recent elections; this figure is lower than the OECD average of 72%. In regards to crime, only 1% of people reported falling victim to assault over the previous 12 months. Money, while it cannot buy happiness, is an important means to achieving higher living standards. In Canada, the average household earned 27 015 USD in 2008, more than the OECD average. In Canada, 87% of adults aged 25 to 64 have earned the equivalent of a high-school diploma, much higher than the OECD average. Canada is a top-performing country in terms of the quality of its educational system. The average student scored 524 out of 600 in reading ability according to the latest PISA student-assessment programme, higher than the OECD average. In terms of employment, nearly 72% of people aged 15 to 64 in Canada have a paid job. People in Canada work 1699 hours a year, less than most in the OECD. 71% of mothers are employed after their children begin school, suggesting that women are able to successfully balance family and career. Seven types of evidence are reviewed that indicate that high subjective well-being (such as life satisfaction, absence of negative emotions, optimism, and positive emotions) causes better health and longevity. For example, prospective longitudinal studies of normal populations provide evidence that various types of subjective well-being such as positive affect predict health and longevity, controlling for health and socioeconomic status at baseline. Combined with experimental human and animal research, as well as naturalistic studies of changes of subjective well-being and physiological processes over time, the case that subjective well-being influences health and longevity in healthy populations is compelling. However, the claim that subjective well-being lengthens the lives of those with certain diseases such as cancer remains controversial. Positive feelings predict longevity and health beyond negative feelings. However, intensely aroused or manic positive affect may be detrimental to health. Issues such as causality, effect size, types of subjective well-being, and statistical controls are discussed. Abel, E.L., & Kruger, M.L. (2010). Smile intensity in photographs predicts longevity. Psychological Science, 21, 542–544. Aboa-Éboulé, C., Brisson, C., Maunsell, E., Masse, B., Bourbonnais, R., Vézina, M. et al. (2007). Job strain and risk of acute recurrent coronary heart disease events. Journal of the American Medical Association, 298, 1652–1660. Barefoot, J.C., Brummett, B.H., Helms, M.J., Mark, D.B., Siegler, I.C., & Williams, R.B. (2000). Depressive symptoms and survival of patients with coronary artery disease. Psychosomatic Medicine, 62, 790–795. Barnett, J.L., & Hemsworth, P.H. (1990). The validity of physiological and behavioural measures of animal welfare. Applied Animal Behaviour Science, 25, 177–187. Bausell, R.B., Lee, W., Soeken, K.L., Li, Y., & Berman, B.M. (2004). Larger effect sizes were associated with higher quality ratings in complementary and alternative medicine randomized controlled trials. Journal of Clinical Epidemiology, 57, 438–446. Berthier, F., & Boulay, F. (2003). Lower myocardial infarction mortality in French men the day France won the 1998 World Cup of football. Heart, 89, 555–556. Bjornskov, C. (2008). Healthy and happy in Europe? On the association between happiness and life expectancy over time. Social Science and Medicine, 66, 1750–1759. Blazer, D.G., & Hybels, C.F. (2004). What symptoms of depression predict mortality in community-dwelling elders? Journal of the American Geriatrics Society, 52, 2052–2056. Boissy, A., Manteuffel, G., Jensen, M.B., Moe, R.O., Spruijt, B., Keeling, L.J. et al. (2007). Assessment of positive emotions in animals to improve their welfare. Physiology & Behavior, 92, 375–397. Bray, I., & Gunnell, D. (2006). Suicide rates, life satisfaction and happiness as markers for population mental health. Social Psychiatry and Psychiatric Epidemiology, 41, 333–337. Bruehl, S., Carlson, C.R., & McCubbin, J.A. (1993). Two brief interventions for acute pain. Pain, 54, 29–36. Brummett, B.H., Boyle, S.H., Kuhn, C.M., Siegler, I.C., & Williams, R.B. (2009). Positive affect is associated with cardiovascular reactivity, norepinephrine level, and morning rise in salivary cortisol. Psychophysiology, 46, 862–869. Brummett, B.H., Boyle, S.H., Siegler, I.C., Williams, R.B., Mark, D.B., & Barefoot, J.C. (2005). Ratings of positive and depressive emotion as predictors of mortality in coronary patients. International Journal of Cardiology, 100, 213–216. Brummett, B.H., Helms, M.J., Dahlstrom, W.G., & Siegler, I.C. (2006). Prediction of all-cause mortality by the Minnesota Multiphasic Personality Inventory Optimism-Pessimism Scale scores: Study of a college sample during a 40-year follow-up period. Mayo Clinic Proceedings, 81, 1541–1544. Buck Louis, G.M., Lum, K.J., Sundaram, C.R. Chen, Z., Kim S., Lynch, C.D. et al. (2010). Stress reduces conception probabilities across the fertile window: Evidence in support of relaxation. Fertility and Sterility, in press. Bullock, J.G., Green, D.P., & Ha, S.E. (2010). Yes, but what’s the mechanism? (Don’t expect an easy answer). Journal of Personality and Social Psychology, 98, 550–558. Burton, C.M., & King, L.A. (2004). The health benefits of writing about intensely positive experiences. Journal of Research in Personality, 38, 150–163. Byrnes, D.M., Antoni, M.H., Goodkin, K., Efantis-Potter, J., Asthana, D., Simon, T. et al. (1998). Stressful events, pessimism, natural killer cell cytotoxicity, and cytotoxic/suppressor T cells in HIV + black women at risk for cervical cancer. Psychosomatic Medicine, 60, 714–722. Capitanio, J.P., & Lerche, N.W. (1998). Social separation, housing relocation, and survival in simian AIDS: A retrospective analysis. Psychosomatic Medicine, 60(3), 235–244. Cappelleri, J.C., Ioannidis, J.P., Schmid, C.H., de Ferranti, S.D., Aubert, M., Chalmers, T.C. et al. (1996). Large trials vs. meta-analysis of smaller trials: How do their results compare? Journal of the American Medical Association, 276, 1332–1338. Carroll, D., Ebrahim, S., Tilling, K., Macleod, J., & Smith, G.D. (2002). Admissions for myocardial infarction and World Cup football: Database survey. British Medical Journal, 325, 21–28. Cherkas, L.F., Aviv, A., Valdes, A.M., Hunkin, J.L., Gardner, J.P., Surdulescu, G.L. et al. (2006). The effects of social status on biological aging as measured by white-blood-cell telomere length. Aging Cell, 5, 361–365. Chida, Y., & Steptoe, A. (2008). Positive psychological well-being and mortality: A quantitative review of prospective observational studies. Psychosomatic Medicine, 70, 741–756. Chow, E., Tsao, M.N., & Harth, T. (2004). Does psychosocial intervention improve survival in cancer? A meta-analysis. Palliative Medicine, 18, 25–31. Cohen, S., Kaplan, J.R., Cunnick, J.E., Manuck, S.B., & Rabin, B.S. (1992). Chronic social stress, affiliation, and cellular immune response in nonhuman primates. Psychological Science, 3, 301–304. Collins, A.L., Goldman, N., & Rodríguez, G. (2008). Is positive well-being protective of mobility limitations among older adults? Journals of Gerontology. Series B, Psychological Sciences and Social Sciences, 63, 321–327. Costanzo, E.S., Lutgendorf, S.K., Kohut, M.L., Nisly, N., Rozeboom, K., Spooner, S. et al. (2004). Mood and cytokine response to influenza virus in older adults. Journals of Gerontology, 59A, 1328–1333. Coyne, J.C., & Tennen, H. (2010). Positive psychology in cancer care: Bad science, exaggerated claims, and unproven medicine. Annals of Behavioral Medicine, 39, 16–26. Coyne, J.C., Tennen, H., & Ranchor, A.V. (2010). Positive psychology in cancer care: A story line resistant to evidence. Annals of Behavioral Medicine, 39, 35–42. Craft, T.K.S. (2006). Psychological determinants of stroke outcome in mice. Unpublished doctoral dissertation, The Ohio State University, Columbus, OH (OhioLINK Digital Resource Commons No. osu1150315601). Retrieved 16 November 2010, from OhioLINK database. Damjanovic, A.K., Yang, Y., Glaser, R., Kiecolt-Glaser, J.K., Nguyen, H., Laskowski, B. et al. (2007). Accelerated telomere erosion is associated with a declining immune function of caregivers of Alzheimer’s disease patients. Journal of Immunology, 179, 4249–4254. Danner, D.D., Snowdon, D.A., & Friesen, W.V. (2001). Positive emotions in early life and longevity: Findings from the nun study. Journal of Personality and Social Psychology, 80, 804–813. Davidson, R.J. (2004). Well-being and affective style: Neural substrate and biobehavioural correlates. Philosophical Transactions of the Royal Society B, 359, 1395–1411. Davidson, R.J., Coe, C.L., Dolski, I., & Donzella, B. (1999). Individual differences in prefrontal activation asymmetry predict natural killer cell activity at rest and in response to challenge. Brain, Behavior, and Immunity, 13, 93–108. Davidson, R.J., Kabat-Zinn, J., Schumacher, J., Rosenkranz, M., Muller, D., Santorelli, S.F. et al. (2003). Alterations in brain and immune function produced by mindfulness meditation. Psychosomatic Medicine, 65, 564–570. Davidson, K.W., Mostofsky, E., & Whang, W. (2010). Don’t worry, be happy: Positive affect and reduced 10-year incident coronary heart disease: The Canadian Nova Scotia Health Survey. European Heart Journal, 31, 1065–1070. Deeg, D.J.H., & van Zonneveld, R.J. (1989). Does happiness lengthen life? The prediction of longevity in the elderly. In R.Veehoven (Ed. 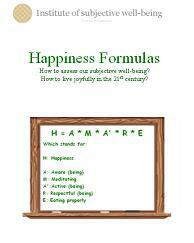 ), How harmfull is happiness? Consequences of enjoying life or not (pp. 29–43). Rotterdam: Universitaire Pers Rotterdam. Detillion, C.E., Craft, T.K.S., Glasper, E.R., Prendergast, B.J., & DeVries, A.C. (2004). Social facilitation of wound healing. Psychoneuroendocrinology, 29, 1004–1011. Doll, R., Peto, R., Wheatley, K., Gray, R., & Sutherland, I. (1994). Mortality in relation to smoking: 40 years’ observations on male British doctors. British Medical Journal, 309, 901–911. Edgerton, R.B. (1992). Sick societies: Challenging the myth of primitive harmony. New York: Free Press. Epel, E.S., Blackburn, E.H., Liu, J., Dhabhar, F.S., Adler, N.E., Morrow, J.D. et al. (2004). Accelerated telomere shortening in response to life stress. Proceedings of the National Academy of Sciences, USA, 101, 17323–17324. Ernst, K., Tuchscherer, M., Kanitz, E., Puppe, B., & Manteuffel, G. (2006). Effects of attention and rewarded activity on immune parameters and wound healing in pigs. Physiology & Behavior, 89, 448–456. Fasman, R. (2009). Social support and positive affect as predictors of pain sensitivity in fibromyalgia and control participants (Doctoral dissertation). Dissertation Abstracts International: Section B: The Sciences and Engineering, 69(7–B), 4474. Fitzgerald, T.E., Prochaska, J.O., & Pransky, G.S. (2000). Health risk reduction and functional restoration following coronary revascularization: A prospective investigation using dynamic stage typology clustering. International Journal of Rehabilitation and Health, 5, 99–116. Fredman, L., Hawkes, W.G., Black, S., Bertrand, R.M., & Magaziner, J. (2006). Elderly patients with hip fracture with positive affect have better functional recovery over 2 years. Journal of the American Geriatrics Society, 54, 1074–1081. Fredrickson, B.L., & Levenson, R.W. (1998). Positive emotions speed recovery from the cardiovascular sequelae of negative emotions. Cognition and Emotion, 12, 191–220. Fredrickson, B.L., Mancuso, R.A., Branigan, C., & Tugade, M.M. (2000). The undoing effect of positive emotions. Motivation and Emotion, 24, 237–258. Freese, J., Meland, S., & Irwin, W. (2007). Expressions of positive emotion in photographs, personality, and later-life marital and health outcomes. Journal of Research in Personality, 41, 488–497. Freestone, P., & Lyte, M. (2010). Stress and microbial endocrinology: Prospects for ruminant nutrition. Animal, 4, 1248–1257. Friedman, H.S., Tucker, J.S., Schwartz, J.E., Tomlinson-Keasey, C., Martin, L.R., Wingard, D.L. et al. (1995). Psychosocial and behavioral predictors of longevity: The aging and death of the “Termites”. American Psychologist, 50, 69–78. Friedman, M., Thoresen, C.E., Gill, J.J., Ulmer, D., Powell, L.H., Price, V.A. et al. (1986). Alteration of type A behavior and its effect on cardiac recurrences in post myocardial infarction patients: Summary results of the recurrent coronary prevention project. American Heart Journal, 112, 653–665. Gidron, Y., Davidson, K., & Bata, I. (1999). The short-term effects of a hostility-reduction intervention on male coronary heart disease patients. Health Psychology, 18, 416–420. Giltay, E.J., Geleijnse, J.M., Zitman, F.G., Hoekstra, T., & Schouten, E.G. (2004). Dispositional optimism and all-cause and cardiovascular mortality in a prospective cohort of elderly Dutch men and women. Archives of General Psychiatry, 61, 1126–1135. Glass, D., Parts, L., Knowles, D., Aviv, A., & Spector, T.D. (2010). No correlation between childhood maltreatment and telomere length. Biological Psychiatry, 68, e21–e22. Grant, N., Wardle, J., & Steptoe, A. (2009). The relationship between life satisfaction and health behavior: A cross-cultural analysis of young adults. International Journal of Behavioral Medicine, 16, 259–268. Gullette, E.C.D., Blumenthal, J.A., Babyak, M., Jiang, W., Waugh, R.A., Frid, D.J. et al. (1997). Effects of mental stress on myocardial ischemia during daily life. Journal of American Medical Association, 277, 1521–1526. Guven, C., & Saloumidis, R. (2009). Why is the world getting older? The influence of happiness on mortality. SOEPpapers, 198, DIW Berlin, The German Socio-Economic Panel (SOEP). Hamilton, A.B. (1996). Do psychosocial factors predict metastatic cancer survival? A longitudinal assessment of breast, colon, and lung cancer patients (Doctoral dissertation). Dissertation Abstracts International: Section B: The Sciences and Engineering, 57(6–B), 4029. Hemingway, H., & Marmot, M. (1999). Psychosocial factors in the aetiology and prognosis of coronary heart disease: Systematic review of prospective cohort studies. British Medical Journal, 318, 1460–1467. Herbert, T.B., & Cohen, S. (1993). Stress and immunity in humans: A meta-analytic review. Psychosomatic Medicine, 55, 364–379. Holden-Lund, C. (1988). Effects of relaxation with guided imagery on surgical stress and wound healing. Research in Nursing & Health, 11, 235–244. Holt-Lunstad, J., Smith, T.B., & Layton, J.B. (2010). Social relationships and mortality risk: A meta-analytic review. PLoS Medicine, 7, e1000316. Howell, R. (2010). Personal communication, 20 October. Howell, R.T., Kern, M.L., & Lyubomirsky, S. (2007). Health benefits: Meta-analytically determining the impact of well-being on objective health outcomes. Health Psychology Review, 1, 83–136. Kahneman, D. (1965). Control of spurious association and the reliability of the controlled variable. Psychological Bulletin, 64, 326–329. Katz, E., Metzger, J., Schlaepfer, J., Fromer, M., Fishman, D., Mayer, L. et al. (2005). Increase of out-of-hospital cardiac arrests in the male population of the French speaking provinces of Switzerland during the 1998 FIFA World Cup. Heart, 91, 1096–1097. Keyes, C.L.M. (2007). Promoting and protecting mental health as flourishing: A complementary strategy for improving national mental health. American Psychologist, 62, 95–108. Khaw, K.T., Wareham, N., Bingham, S., Welch, A., Luben, R., & Day, N. (2008). Combined impact of health behaviors and mortality in men and women: The EPIC-Norfolk prospective population study. PLoS Medicine, 5, 39–47. Kiecolt-Glaser, J.K., Graham, J.E., Malarkey, W.B., Porter, K., Lemeshow, S., & Glaser, R. (2008). Olfactory influences on mood and autonomic, endocrine, and immune function. Psychoneuroendocrinology, 33, 328–339. Kiecolt-Glaser, J.K., Loving, T.J., Stowell, J.R., Malarkey, W.B., Lemeshow, S., Dickinson, S.L. et al. (2005). Hostile marital interactions, proinflammatory cytokine production, and wound healing. Archives of General Psychiatry, 62, 1377–1384. Kiecolt-Glaser, J.K., McGuire, L., Robles, T.F., & Glaser, R. (2002). Emotions, morbidity, and mortality: New perspectives from psychoneuroimmunology. Annual Review of Psychology, 53, 83–107. Kobau, R., Seligman, M.E.P., Peterson, C., Diener, E., Zack, M.M., Chapman, D. et al. (in press). Mental health promotion in public health: Perspectives and strategies from positive psychology. American Journal of Public Health. Kohut, M.L., Cooper, M.M., Nickolaus, M.S., Russell, D.R., & Cunnick, J.E. (2002). Exercise and psychosocial factors modulate immunity to influenza vaccine in elderly individuals. Journals of Gerontology, 57A, M557–M562. Koivumaa-Honkanen, H., Honkanen, R., Koskenvuo, M., & Kaprio, J. (2003). Self-reported happiness in life and suicide in ensuing 20 years. Social Psychiatry and Psychiatric Epidemiology, 38, 244–248. Koivumaa-Honkanen, H., Honkanen, R., Koskenvuo, M., Viinamäki, H., & Kaprio, J. (2002). Life dissatisfaction as a predictor of fatal injury in a 20-year follow-up. Acta Psychiatrica Scandinavica, 105, 444–450. Koivumaa-Honkanen, H., Honkanen, R., Viinamaki, H., Heikkila, K., Kaprio, J., & Koskenvuo, M. (2000). Self-reported life satisfaction and 20-year mortality in healthy Finnish adults. American Journal of Epidemiology, 152, 983–991. Koivumaa-Honkanen, H., Honkanen, R., Viinamaki, H., Heikkila, K., Kaprio, J., & Koskenvuo, M. (2001). Life satisfaction and suicide: A 20-year follow-up study. American Journal of Psychiatry, 158, 433–439. Koivumaa-Honkanen, H., Koskenvuo, M., Honkanen, R.J., Viinamäki, H., Heikkilä, K., & Kaprio, J. (2004). Life dissatisfaction and subsequent work disability in an 11-year follow-up. Psychological Medicine, 34, 221–228. Koopmans, T.A., Geleijnse, J.M., Zitman, F.G., & Giltay, E.J. (2010). Effects of happiness on all-cause mortality during 15 years of follow-up: The Arnhem Elderly Study. Journal of Happiness Studies, 11, 113–124. Kubzansky, L.D., Sparrow, D., Vokonas, P., & Kawachi, I. (2001). Is the glass half empty or half full? A prospective study of optimism and coronary heart disease in the normative aging study. Psychosomatic Medicine, 63, 910–916. Kung, S., Rummans, T.A., Colligan, R.C., Clark, M.M., Sloan, J.A., Novotny, P.J. et al. (2006). Association of optimism–pessimism with quality of life in patients with head and neck and thyroid cancers. Mayo Clinic Proceedings, 81, 1545–1552. Kvaavik, E., Batty, G.D., Ursin, G., Huxley, R., & Gale, C.R. (2010). Influence of individual and combined health behaviors on total and cause-specific mortality in men and women: The United Kingdom health and lifestyle survey. Archives of Internal Medicine, 170, 711–718. Lett, H.S., Blumenthal, J.A., Babyak, M.A., Sherwood, A., Strauman, T., Robins, C. et al. (2004). Depression as a risk factor for coronary artery disease: Evidence, mechanisms, and treatment. Psychosomatic Medicine, 66, 305–315. Loberiza, F.R., Rizzo, J.D., Bredeson, C.N., Antin, J.H., Horowitz, M.M., Weeks, J.C. et al. (2002). Association of depressive syndrome and early deaths among patients after stem-cell transplantation for malignant diseases. Journal of Clinical Oncology, 20, 2118–2126. Lung, F., Chen, N.C., & Shu, B. (2007). Genetic pathway of major depressive disorder in shortening telomeric length. Psychiatric Genetics, 17, 195–199. Lyrra, T., Törmäkangas, T.M., Read, S., Rantanen, T., & Berg, S. (2006). Satisfaction with present life predicts survival in octogenarians. Journals of Gerontology. Series B, Psychological Sciences and Social Sciences, 61, 319–326. Lyubomirsky, S., King, L., & Diener, E. (2005). The benefits of frequent positive affect: Does happiness lead to success? Psychological Bulletin, 131, 803–855. McCarron, P., Gunnell, D., Harrison, G.L., Okasha, M., & Davey Smith, G. (2003). Temperament in young adulthood and later mortality: Prospective observational study. Journal of Epidemiology and Community Health, 57, 888–892. Manuck, S.B., Kaplan, J.R., & Clarkson, T.B. (1983). Social instability and coronary artery atherosclerosis in cynomolgus monkeys. Neuroscience & Biobehavioral Reviews, 7, 485–491. Marsland, A.L., Cohen, S., Rabin, B.S., & Manuck, S.B. (2006). Trait positive affect and antibody response to hepatitis B vaccination. Brain, Behavior, and Immunity, 20, 261–269. Marsland, A.L., Prather, A.A., Petersen, K.L., Cohen, S., & Manuck, S.B. (2008). Antagonistic characteristics are positively associated with inflammatory markers independently of trait negative emotionality. Brain, Behavior, and Immunity, 22, 753–761. Marsland, A.L., Pressman, S., & Cohen, S. (2007). Positive affect and immune function. In R.Ader (Ed. ), Psychoneuroimmunology (4th edn., Vol. 2, pp. 761–779). San Diego, CA: Elsevier. Marucha, P.T., Kiecolt-Glaser, J.K., & Favagehi, M. (1998). Mucosal wound healing is impaired by examination stress. Psychosomatic Medicine, 60, 362–365. Master, S.L., Eisenberger, N.I., Taylor, S.E., Naliboff, B.D., Shirinyan, D., & Lieberman, M.D. (2009). A picture’s worth: Partner photographs reduce experimentally induced pain. Psychological Science, 20, 1316–1318. Meehl, P.E. (1970). Nuisance variables and the ex post facto design. In M.Radner & S.Winokur (Eds. ), Minnesota studies in the philosophy of science, IV (pp. 373–402). Minneapolis, MN: University of Minnesota Press. Miller, G.E., & Chen, E. (2010). Harsh family climate in early life presages the emergence of a proinflammatory phenotype in adolescence. Psychological Science, 21, 848–856. Miller, T.Q., Smith, T.W., Turner, C.W., Guijarro, M.L., & Hallet, A.J. (1996). A meta-analytic review of research on hostility and physical health. Psychological Bulletin, 119, 322–348. Moskowitz, J.T. (2003). Positive affect predicts lower risk of AIDS mortality. Psychosomatic Medicine, 65, 620–626. Moskowitz, J.T., Epel, E.S., & Acree, M. (2008). Positive affect uniquely predicts lower risk of mortality in people with diabetes. Health Psychology, 27, S73–S82. Myrtek, M. (2001). Meta-analyses of prospective studies on coronary heart disease, type A personality, and hostility. International Journal of Cardiology, 79, 245–251. Nabi, H., Kivimaki, M., De Vogli, R., Marmot, M.G., & Singh-Manoux, A. (2008). Positive and negative affect and risk of coronary heart disease: Whitehall II prospective cohort study. British Medical Journal, 337, 32–36. Ostir, G.V., Berges, I.M., Markides, K.S., & Ottenbacher, K.J. (2006). Hypertension in older adults and the role of positive emotions. Psychosomatic Medicine, 68, 727–733. Ostir, G.V., Berges, I., Ottenbacher, M.E., Clow, A., & Ottenbacher, K.J. (2008). Associations between positive emotion and recovery of functional status following stroke. Psychosomatic Medicine, 70, 404–409. Ostir, G.V., Markides, K.S., Black, S.A., & Goodwin, J.S. (2000). Emotional well-being predicts subsequent functional independence and survival. Journal of the American Geriatrics Society, 48, 473–478. Ostir, G.V., Markides, K.S., Peek, M.K., & Goodwin, J.S. (2001). The association between emotional well-being and the incidence of stroke in older adults. Psychosomatic Medicine, 63, 210–215. Ostir, G.V., Ottenbacher, K.J., & Markides, K.S. (2004). Onset of frailty in older adults and the protective role of positive affect. Psychology and Aging, 19, 402–408. Paterniti, S., Zureik, M., Ducimetiere, P., Touboul, P., Feve, J., & Alperovitch, A. (2001). Sustained anxiety and 4-year progression of carotid atherosclerosis. Arteriosclerosis, Thrombosis, and Vascular Biology, 21, 136–141. Patton, G., Romaniuk, H., Tollit, M., Spence, S., Sheffield, J., & Sawyer, M. (in press). A prospective study of the effects of optimism on adolescent health risks. Pediatrics. Petticrew, M., Gilbody, S., & Sheldon, T.A. (1999). Relation between hostility and coronary heart disease. British Medical Journal, 319, 917. Pressman, S.D., & Cohen, S. (2010). The association between positive emotional word use in autobiographies and longevity in famous deceased psychologists. Manuscript submitted for publication, University of Kansas. Raikkonen, K., Matthews, K.A., Flory, J.D., Owens, J.F., & Gump, B.B. (1999). Effects of optimism, pessimism, and trait anxiety on ambulatory blood pressure and mood during everyday life. Journal of Personality and Social Psychology, 76, 104–113. Richman, L.S., Kubzansky, L., Maselko, J., Kawachi, I., Choo, P., & Bauer, M. (2005). Positive emotion and health: Going beyond the negative. Health Psychology, 24, 422–429. Ringbäck Weitoft, G., & Rosén, M. (2005). Is perceived nervousness and anxiety a predictor of premature mortality and severe morbidity? A longitudinal follow up of the Swedish survey of living conditions. Journal of Epidemiology and Community Health, 59, 794–798. Ritz, T., & Steptoe, A. (2000). Emotion and pulmonary function in asthma: Reactivity in the field and relationship with laboratory induction of emotion. Psychosomatic Medicine, 62, 808–815. Robles, T.F., Brooks, K.P., & Pressman, S.D. (2009). Trait positive affect buffers the effects of acute stress on skin barrier recovery. Health Psychology, 28, 373–378. Rosenkranz, M.A., Jackson, D.C., Dalton, K.M., Dolski, I., Ryff, C.D., Singer, B.H. et al. (2003). Affective style in vivo immune response: Neurobehavioral mechanisms. Proceedings of the National Academy of Sciences, USA, 100, 11148–11152. Rozanski, A., Blumenthal, J.A., & Kaplan, J. (1999). Impact of psychological factors on the pathogenesis of cardiovascular disease and implications for therapy. Circulation, 99, 2192–2217. Rugulies, R. (2002). Depression as a predictor for coronary heart disease. American Journal of Preventive Medicine, 23, 51–61. Salak-Johnson, J.L., & McGlone, J.J. (2007). Making sense of apparently conflicting data: Stress and immunity in swine and cattle. Journal of Animal Science, 85, E81–E88. Sapolsky, R. (2005). Sick of poverty. Scientific American, 293, 92–99. Scheier, M.F., Matthews, K.A., Owens, J.F., Magouern, G.J, Lefebvre, R.C., Abbott, R.A. et al. (1989). Dispositional optimism and recovery from coronary artery bypass surgery: The beneficial effects on physical and psychological well-being. Journal of Personality and Social Psychology, 57, 1024–1040. Scherer, M., & Herrmann-Lingen, C. (2009). Single item on positive affect is associated with 1-year survival in consecutive medical inpatients. General Hospital Psychiatry, 31, 8–13. Schlotz, W., Hellhammer, J., Schulz, P., & Stone, A.A. (2004). Perceived work overload and chronic working predict weekend–weekday differences in the cortisol awakening response. Psychosomatic Medicine, 66, 207–214. Schneider, R.H., Staggers, F., Alexander, C.N., Sheppard, W., Rainforth, M., Kondwani, K. et al. (1995). A randomized controlled trial of stress reduction for hypertension in older African Americans. Hypertension, 26, 820–827. Schneiderman, N., Antoni, M.H., Saab, P.G., & Ironson, G. (2001). Health psychology: Psychosocial and biobehavioral aspects of chronic disease management. Annual Review of Psychology, 52, 555–580. Seeman, T.E., Singer, B.H., Ryff, C.D., Dienberg Love, G., & Levy-Storms, L. (2002). Social relationships, gender, and allostatic load across two age cohorts. Psychosomatic Medicine, 64, 395–406. Segerstrom, S.C. (2001). Optimism, goal conflict, and stressor-related immune change. Journal of Behavioral Medicine, 24, 441–467. Segerstrom, S.C. (2005). Optimism and immunity: Do positive thoughts always lead to positive effects? Brain, Behavior, and Immunity, 19, 195–200. Segerstrom, S.C., & Miller, G.E. (2004). Psychological stress and the human immune system: A meta-analytic study of 30 years of inquiry. Psychological Bulletin, 130, 601–630. Segerstrom, S.C., & Sephton, S.E. (2010). Optimistic expectancies and cell-mediated immunity: The role of positive affect. Psychological Science, 21, 448–455. Seligman, M.E.P., Peterson, C., Barsky, A.J., Boehm, J.K., Kubzansky, L.D., & Park, N. (2010). Positive health and health assets: Re-analysis of longitudinal data sets. Unpublished manuscript, University of Pennsylvania. Shen, B.J., Avivi, Y.E., Todaro, J.F., Spiro, A., Laurenceau, J., Ward, K. et al. (2008). Anxiety characteristics independently and prospectively predict myocardial infarction in men: The unique contribution of anxiety among psychological factors. Journal of the American College of Cardiology, 51, 113–119. Shirai, K., Iso, H., Ohira, T., Ikeda, A., Noda, H., Honjo, K. et al. (2009). Perceived level of life enjoyment and risks of cardiovascular disease incidence and mortality: The Japan public health center-based study. Circulation, 120, 956–963. Siahpush, M., Spittal, M., & Singh, G.K. (2008). Happiness and life satisfaction prospectively predict self-rated health, physical health, and the presence of limiting, long-term health conditions. American Journal of Health Promotion, 23, 18–26. Smith, T.W., Glazer, K., Ruiz, J.M., & Gallo, L.C. (2004). Hostility, anger, aggressiveness, and coronary heart disease: An interpersonal perspective on personality, emotion and health. Journal of Personality, 72, 1217–1270. Smyth, J., Ockenfels, M.C., Porter, L., Kirschbaum, C., Hellhammer, D.H., & Stone, A.A. (1998). Stressors and mood measured on a momentary basis are associated with salivary cortisol secretion. Psychoneuroendocrinology, 23, 353–370. Spiegel, D. (1996). Cancer and depression. British Journal of Psychiatry, 30, 109–116. Spiegel, D., Butler, L.D., Giese-Davis, J., Koopman, C., Miller, E., DiMiceli, S. et al. (2007). Effects of supportive-expressive group therapy on survival of patients with metastatic breast cancer: A randomized prospective trial. Cancer, 110, 1130–1138. Steptoe, A., Dockray, S., & Wardle, J. (2009). Positive affect and psychobiological processes relevant to health. Journal of Personality, 77, 1747–1776. Steptoe, A., Wardle, J., & Marmot, M. (2005). Positive affect and health-related neuroendocrine, cardiovascular, and inflammatory processes. Proceedings of the National Academy of Sciences, USA, 102, 6508–6512. Strand, E.B., Zautra, A.J., Thoresen, M., Ødegård, S., Uhlig, T., & Finset, A. (2006). Positive affect as a factor of resilience in the pain–negative affect relationship in patients with rheumatoid arthritis. Journal of Psychosomatic Research, 60, 477–484. Strik, J.J.M.H., Denollet, J., Lousberg, R., & Honig, A. (2003). Comparing symptoms of depression and anxiety as predictors of cardiac events and increased health care consumption after myocardial infarction. Journal of the American College of Cardiology, 42, 1801–1807. Suls, J., & Bunde, J. (2005). Anger, anxiety, and depression as risk factors for cardiovascular disease: The problems and implications of overlapping affective dispositions. Psychological Bulletin, 131, 260–300. Tang, N.K., Salkovskis, P.M., Hodges, A., Wright, K.J., Hanna, M., & Hester, J. (2008). Effects of mood on pain responses and pain tolerance: An experimental study in chronic back pain patients. Pain, 138, 392–401. Temel, J.S., Greeg, J.A., Muzikansky, A., Gallagher, E.R., Admane, S., Jackson, V.A. et al. (2010). Early palliative care for patients with metastatic non-small-cell lung cancer. New England Journal of Medicine, 363, 733–742. Tindle, H.A., Chang, Y., Kuller, L.H., Manson, J.E., Robinson, J.G., Rosal, M.C. et al. (2009). Optimism, cynical hostility, and incident coronary heart disease and mortality in the Women’s Health Initiative. Circulation, 120, 656–662. Tomakowsky, J., Lumley, M.A., Markowitz, N., & Frank, C. (2001). Optimistic explanatory style and dispositional optimism in HIV-infected men. Journal of Psychosomatic Research, 51, 577–587. Tyrka, A.R., Price, L.H., Kao, H., Porton, B., Marsella, S.A., & Carpenter, L.L. (2010). Childhood maltreatment and telomere shortening: Preliminary support for an effect of early stress on cellular aging. Biological Psychiatry, 67, 531–534. Vazquez, C., Hervas, G., Rahona, J.J., & Gomez, D. (2009). Psychological well-being and health: Contributions of positive psychology. Annuary of Clinical and Health Psychology, 5, 15–27. Veenhoven, R. (2008). Healthy happiness: Effect of happiness on physical health and the consequences for preventive health care. Journal of Happiness Studies, 9, 449–469. Von Borell, E. (1995). Neuroendocrine integration of stress and significance of stress for the performance of farm animals. Applied Animal Behaviour Science, 44, 219–227. Whang, W., Kubzansky, L.D., Kawachi, I., Rexrode, K.M., Kroenke, C.H., Glynn, R.J. et al. (2009). Depression and risk of sudden cardiac death and coronary heart disease in women: Results from the Nurses’ Health Study. Journal of the American College of Cardiology, 53, 950–958. Whooley, M.A., & Browner, W.S. (1998). Association between depressive symptoms and mortality in older women: Study of Osteoporotic Fractures Research Group. Archives of Internal Medicine, 158, 2129–2135. Williams, R.B., & Schneiderman, N. (2002). Resolved: Psychosocial interventions can improve clinical outcomes in organic disease (pro). Psychosomatic Medicine, 64, 552–557. Willmarth, E.K. (1999). Modification of experienced pain with hypnotically induced positive mood (Doctoral dissertation). Dissertation Abstracts International: Section B: The Sciences and Engineering, 60(3–B), 1320. Wilson, R.S., Bienias, J.L., Mendes de Leon, C.F., Evans, D.A., & Bennett, D.A. (2003). Negative affect and mortality in older persons. American Journal of Epidemiology, 158, 827–835. Xu, J., & Roberts, R.E. (2010). The power of positive emotions: It’s a matter of life or death—Subjective well-being and longevity over 28 years in a general population. Health Psychology, 29, 9–19. Are you happy with your personal income? Are you satisfied with your education? Do you trust politicians and your local council? These are some of the questions the British government wants answers to, in its quest to find out the state of the nation beyond just the economic data. The Office for National Statistics published the list of 10 indicators of well-being on Monday, a year after the government announced plans to officially monitor the country’s happiness. Prime Minister David Cameron has said his “happiness index” could help form the basis of his coalition government’s future policies. “We’ll continue to measure GDP as we’ve always done. But it is high time we admitted that, taken on its own, GDP is an incomplete way of measuring a country’s progress,” he said last year. Top of the list of measures of the nation’s happiness will be individual happiness. Six other factors bearing on personal well-being – the state of relationships, health, education, occupation, income, neighbourhood – will be gauged. Governance, the economy and the environment will also be factored in. Respondents would be asked about their job satisfaction and whether they feel they achieve a balance of work and leisure activities. They will also be asked about their financial situation and their relationship with their husband or wife. On neighbourhoods, they would be asked about their involvement in their local area and sense of belonging, as well as feelings of personal safety. Questions about education, the importance of learning new things and satisfaction with the standard of the national education system would also be included. Official statistics on what percentage of the population voted, the state of the economy and the natural environment will be added to give context. After a consultation exercise, which ends in January, statisticians will consider scrapping indicators from the shortlist or adding new ones. A summary of people’s views will be published next spring, between March and May. The first happiness index, called the Gross National Happiness (GNH), was developed in Bhutan in the 1970s to replace GDP data. The Centre for Bhutan Studies, the government’s think-tank, did an exhaustive sample survey and determined that a happy society involves the four pillars of economy, culture, environment and good governance. It conducts surveys once every two years based on the indicators and then screens all policy initiatives to ensure they enhance GNH. In Europe, French President Nicolas Sarkozy announced in 2009 that he intended to include happiness and well-being in France’s measurement of economic progress. Mr Sarkozy was responding to recommendations made by two Nobel economists, Joseph Stiglitz and Amartya Sen, who called on world leaders to move away from a purely economic concept of gross domestic product, which measures economic production, to well-being and sustainability. Statisticians in Canada also poll subjective well-being across the country though it is not part of their official data set. Uncategorized Subjective well-being: Britain asks its citizens "Are you happy?" OECD Better Life Index, from its official definition, is an interactive tool which allows to create an index based on the topics that are important to you – because there is more to life than the cold numbers of GDP and economic statistics. The OECD Better Life Index covers the 34 Countries which are member of the OECD. Instead of ranking the countries, the index allows to see how countries score overall and by each variable.